With the popularity of ABS-CBN's "Walang Hanggan" main cast Coco Martin and Julia Montes, you may also check out this Walang Hanggan Funny Picture, which is now viral, posted and shared in different social media and blog sites. 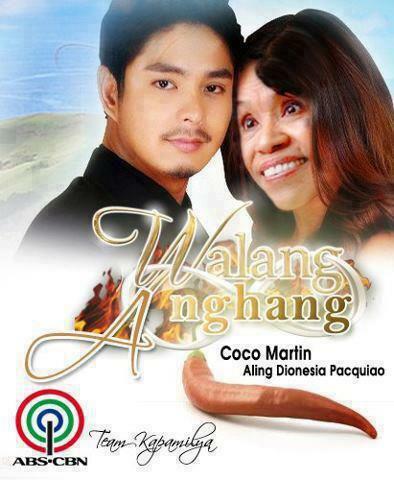 The said image is edited which features the poster of Walang Hanggan-Coco Martin and Aling Dionesia. Walang Hanggan, is the ABS-CBN's Primetime Bida drama series showcases powerhouse cast which features the undying love that revolves around characters from three different generations: the love triangle among Virginia (Susan Roces Roces), Margaret (Helen Gamboa), and John (Eddie Gutierrez); the ill-fated lovers Marco (Richard Gomez) and Emily (Dawn Zulueta); and young sweethearts Daniel (Coco Martin) and Katerina (Julia Montes). According to the January 16 data released by Kantar Medi, "Walang Hanggan" became the most-watched program on its premiere, grabbing high ratings nationwide. 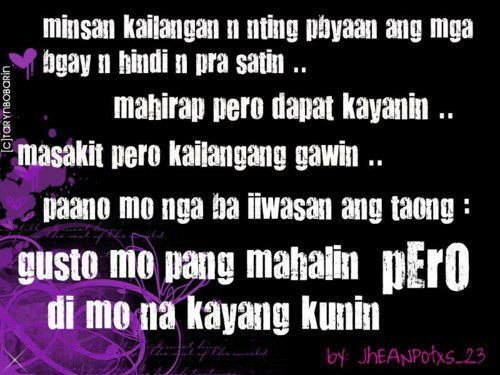 Walang Hanggan, is written by Reggie Amigo and Noreen Capili, directed by Jerry Lopez Sineneng, Trina N. Dayrit, Jojo A. Saguin. 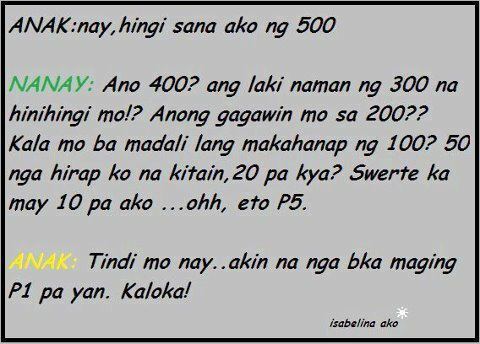 Check out this funny Tagalog Nanay and Anak Jokes, posted and shared in different social media and blog sites. Anak: kakaliskisan ko po ba? Nanay: tanggalin mo na rin yung hasang ng masulit ang katangahan mo hayup ka!!! Anak: Tindi mo Nay...akin na nga baka maging P1 pa yan Kaloka! ang saya saya kasi ako mag isa! This Ang Sakit! 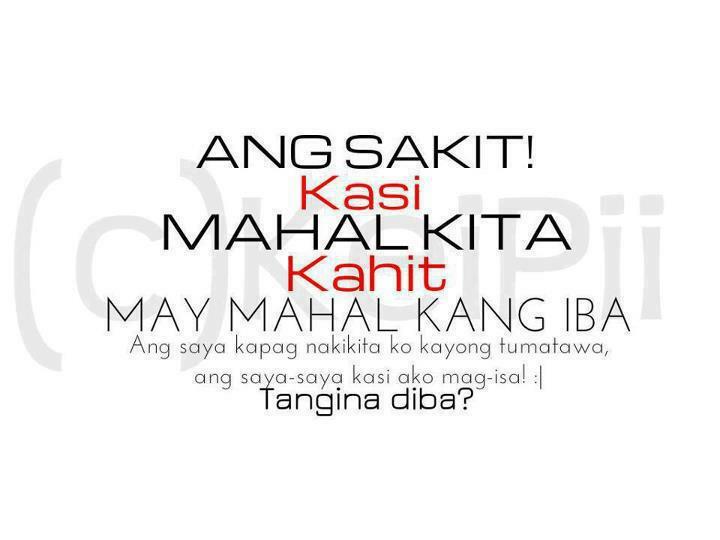 May Mahal kang Iba Quotes Image really hurts, but probably a hundred times a day. Just because it wasn't hurtingyou doesn't mean you didn't notice it. It leaves a gap & sometimes you see yourself missing it terribly. It's going to take a while, but it takes time. Should you have kept the tooth? No, coz it was causing you so much pain. Learn to let go! 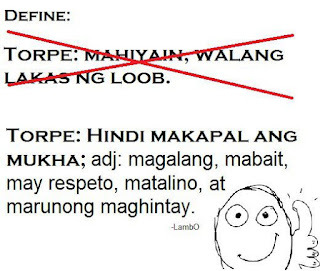 Torpe, Tagalog or Filipino slang language for someone who lacks the ability to court a girl or how to talk to a girl. 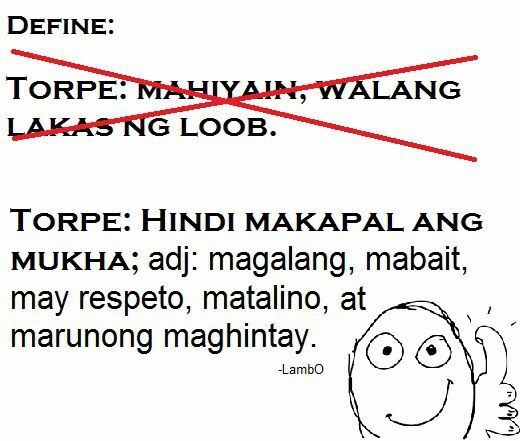 In Tagalog, they say it's Mahiyain, walang lakas ng loob, think again and check out this another Definition of Torpe posted and shared in different social network and blog sites. 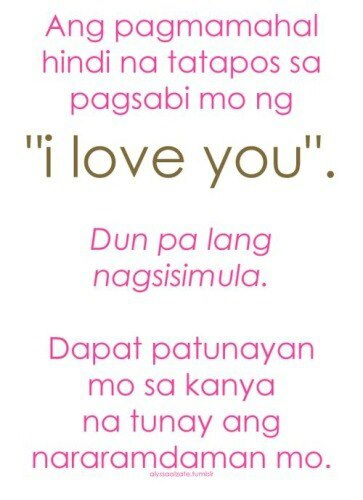 Letting go of someone is hard to do, especially if that person is really special and makes you as whole person. 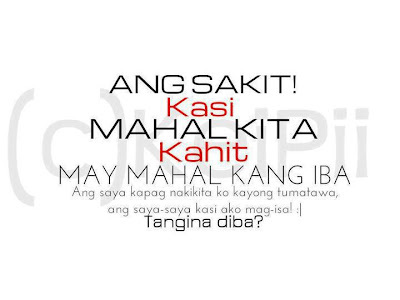 check out this Tagalog Letting Go Quotes posted and shared in different social media and blog sites. ang mga bagay na hindi para satin..
mo sa isang tao na mahal mo siya. Looking for the perfect love quotes and picture for your status on social network sites? 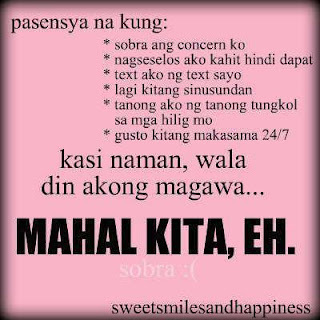 check out this Tagalog Love Quotes Picture posted and shared in different socia media and blog sites. Want to express what inside your heart for your special someone? 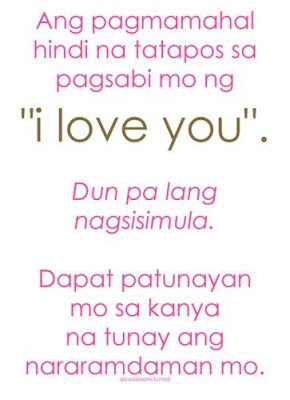 well check out this Mahal Kita Quotes Picture, posted and shared on different social networks and blog sites. 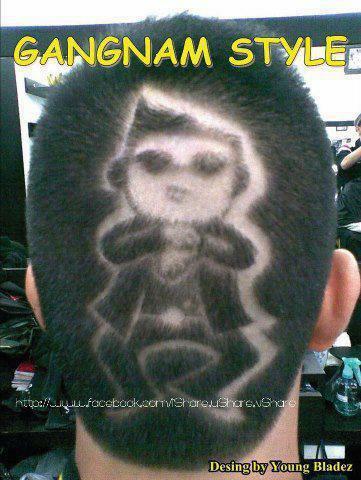 Because the PSY's Oppa Gangnam Style is now viral and trending in the world of social networks and video streaming sites, well, check out this one picture which features artistic Gangnam Style Haircut, posted and shared in different social sites. Oppa Gangnam Style video was first released on July 15, 2012, and it makes way on the top of the singles chart in Gaon Chart and it most views as K-Pop song hitting over a 90 million views and still counting on Youtube and different video streaming sites. The Oppa Gangnam Style is about perfect girlfriend who knows when to be refined and when to get wild. 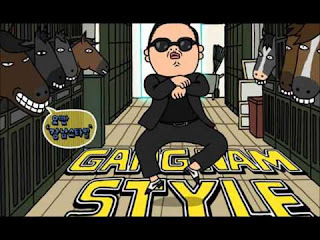 Oppa Gangnam Style video is performed and lyrics by Korean pop singer PSY and arranged by by Yoo Gun-hyung, who is a well-known producer in South Korea. So do you think the Oppa Gangnam Style will surpassed the Call me Maybe? or the Teach Me How to Dougie? Go check out the video and do the Gangnam Style. Have you heard and seen the latest dance craze today? 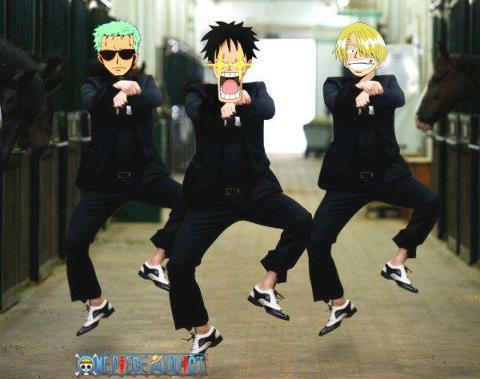 After the huge success of "Teachie How to Dougie" and the "Call Me Maybe" by Carly Rae Jepsen, Here comes the Oppa Gangnam Style. So don't left behind see this Oppa Gangnam Style music video on different video streaming sites and and dance with it. Oppa Gangnam Style is the latest international pop dance craze today which is witten and performed by South Korean Rapper PSY (Park Jae Sung). First relased on July 15, 2012 and hits in the Youtube with over 90 million views worldwide.